In absence of information (from the drug labels or from the AUC studies), or if the active principles are more than two it would be of interest to do an hypothesis about the metabolic interactions. This is possible starting from the enzymatic constants and considering the impact of each active principle as a substrate, inhibitor or inducer of various enzymes. Take a look to the graph in the Check-Pk page. 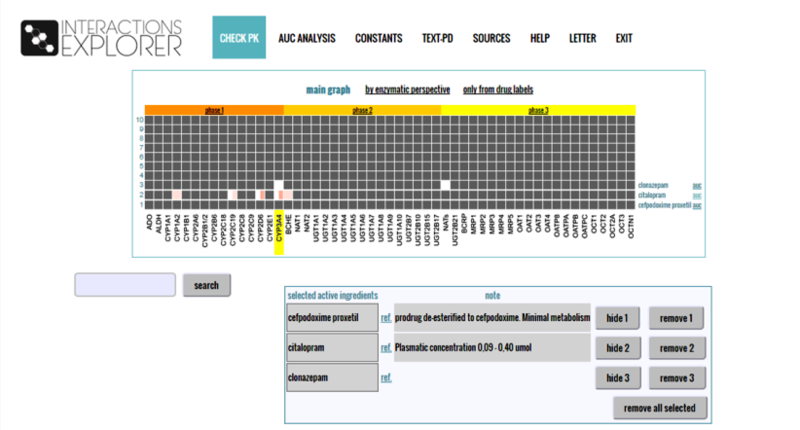 Each row corresponds to an active principles, each column to an enzyme. The enzymes are divided according to the three phases of the metabolism. 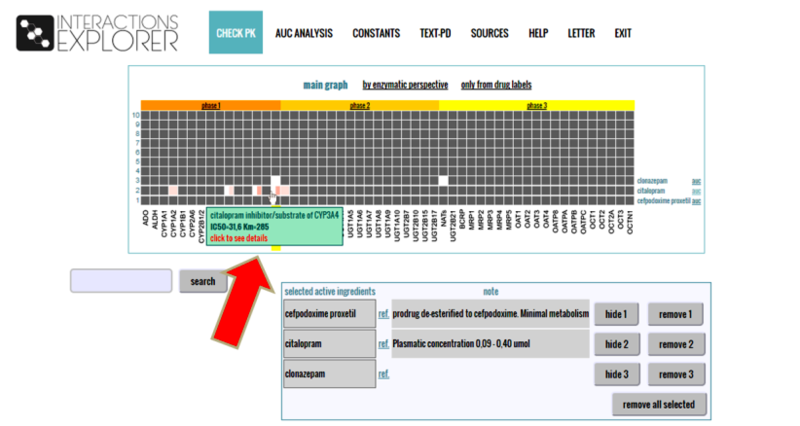 The graph displays by default 53 enzymes – most frequently implicated in pharmacokinetic interactions. However, adding active principles that affect other enzymes will make the graph extends laterally. Similarly, the graph can be extended vertically when you select more than 10 active principles. As you select the active principles, in the above graph are made up colorful boxes. 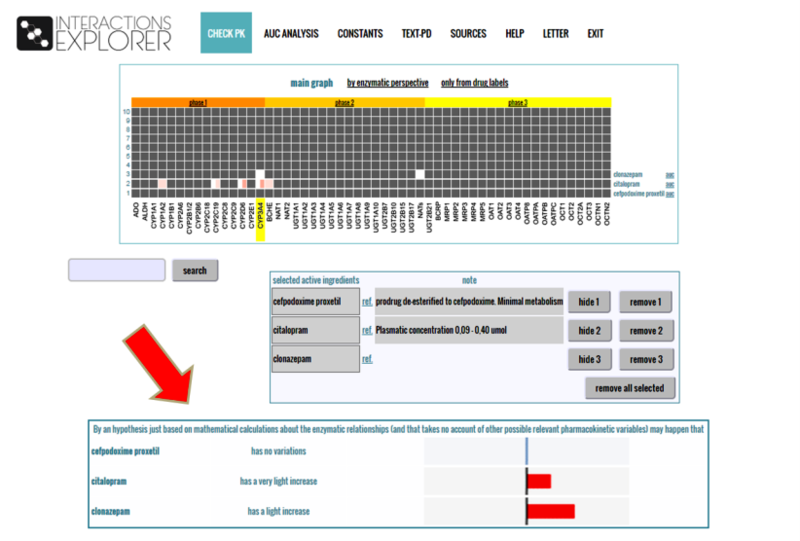 When you select multiple active principles that would conflict on an enzyme, the name of the enzyme is highlighted in yellow. Moving the pointer on the boxes a tool-tip shows the constant values, if available. Clicking on the box you’ll be addressed to the Constant page. Above the chart you will find the links to two charts that show similar data with the same active principles selected. The first focuses on the enzyme bond, the other contains only the data reported in the drug labels. Therefore the graph will facilitate an overview of the mutual interference. 1) If the active principle is a substrate of many enzymes it is arguably insensitive to inhibition to only one of them by another substance and has alternatives for its degradation. 2) Many substrates of the same enzyme may have a mutual inhibitory effect because the enzymatic competition mechanism. 3) Multiple inhibitions or inductions on the same enzyme generate a greater effect. 4) The simultaneous presence of a single enzyme inhibition and induction from an active principle (red and green box on the chart) often indicate that after the initial inhibition (inhibition appears soon, sometimes after the first dose) along the time an inhibition mitigation or reversal to the induction may occur. That is because induction is a phenomenon that takes time, depending on the time of protein transcription.